Klaxon has produced a handy pocket sized guide to EN54-23. 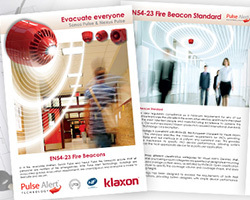 This includes a host of useful information for system designers, specifiers and installers who are looking to improve fire evacuation performance and comply with the latest standard requirements. Our best practice guide highlights key system design considerations, and general rules for the selection and siting of Visual Alarm Devices (VADs). Sonos Pulse and Nexus Pulse specifications are also included to aid product selection and system design. This new EN54-23 pocket guide is available from the downloads tab.